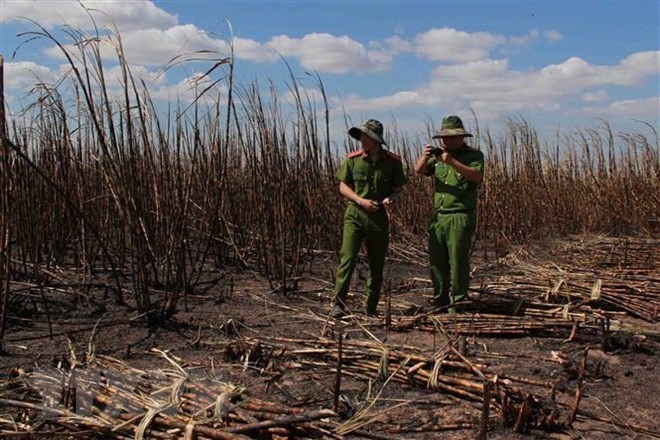 GIA LAI — A fire destroyed 100ha of sugarcane plantations in the Central Highlands province of Gia Lai on Saturday afternoon. Major Ngô Hoài Nam, deputy chief of the province’s Ea Sup District police, said several farmers in Ya Tờ Mốt Commune discovered the fire in the early afternoon and called for help. The dry conditions meant the fire quickly spread across Ya Tờ Mốt Commune and neighbouring Ea Bung Commune. Farmer Lương Văn Tí said seven out of the eight hectares he was cultivating under a project with the Đắk Lắk Sugar Company had been destroyed. According to Lieutenant Colonel Nguyễn Hải Quân, chief of the Ea Sup District police investigation team, said preliminary findings pointed to local people burning vegetation combined with high winds. Resident Trương Văn Nam said he had witnessed a villager burning vegetation in a plot belonging to Minh Hằng Limited Company and informed local authorities. On Sunday and Monday, local farmers were trying to salvage usable sugarcane to sell to sugar factories.